23andMe’s Emily Drabant, PhD, speaking at a Parkinson’s event in Iowa. 23andMe is tantalizingly close to reaching the goal of enrolling 10,000 patients in our Parkinson’s research community. We’re past the 8,000 mark and the pace of enrollment is now more than two-and-a-half times what was a year ago, but we’re not there yet. Getting to 10,000 is important because as any researcher will tell you, there is strength in numbers. Having what is already the world’s largest Parkinson’s community for genetic research helped us discover new genetic variants associated with Parkinson’s – including a potentially protective factor. While we’ve already dramatically accelerated the pace of Parkinson’s research, we still have much work to do both in better understanding the disease and in finding new treatments. Later this month, Emily Drabant, PhD, 23andMe’s research manager for our Parkinson’s community, will speak at the Cleveland Clinic’s Lou Ruvo Center for Brain Health in Las Vegas about 23andMe’s unique patient-centered research model, what we know about the genetics of Parkinson’s and some of the latest advances in Parkinson’s research. The presentation is specifically for patients at the Cleveland Clinic, which is one of our Parkinson’s research collaborators. We’re recruiting 1,000 Parkinson’s patients from the Cleveland Clinic for a sub-study that will integrate clinical data with genetics. Parkinson’s is an extremely complex disease. Uncovering more about the role genetics plays in Parkinson’s could provide valuable information about the development of the disease and how to combat it. Last year 23andMe found two new genetic associations with Parkinson’s and more recently found a genetic variant in the gene SGK1 that is potentially protective against the disease. With the help of the Michael J. Fox Foundation, the Scripps Research Institute is following up the SGK1 discovery with lab studies that we hope will lead to new treatments. We hope to add more breakthroughs as we reach our goal of 10,000 members in the Parkinson’s Research Community. 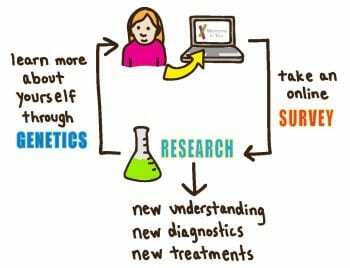 As a member of 23andMe, you can participate in research simply by taking surveys. If you have Parkinson’s disease or know someone who does, learn more about joining our Parkinson’s Disease initiative! Of course, the success of the 23andMe’s Parkinson’s Community has come with the help of some very active members of the community, including more than 200 Parkinson’s “Ambassadors,” who’ve helped spread the word about the research. 23andMe has also received the support of some great people, Michael J. Fox and Muhammad Ali, who have both lent their efforts to the cause. Finally we’ve been helped by some fantastic partners like the Cleveland Clinic, the Michael J. Fox Foundation, the Parkinson’s Institute, the National Parkinson Foundation, the Parkinson’s Association of San Diego, the Cure Parkinson’s Trust and Parkinson’s UK.